Education and sports minister Hakubun Shimomura bows in the Upper House on May 13 after the bill to establish a sports agency is approved. Many Japanese must be wondering how a new sports agency, slated to be established in October, will change the environment surrounding their sports lives. The agency, to be created as an extra-ministerial organ of the Ministry of Education, Culture, Sports, Science and Technology, is expected to serve as the headquarters for integrating the administration of sports-related policies, which has long been spread over different ministries and agencies. One big boost for setting up the new agency came from Tokyo’s successful bid to host the 2020 Summer Olympics and Paralympics. The Japanese Olympic Committee and various sports organizations are in high spirits. 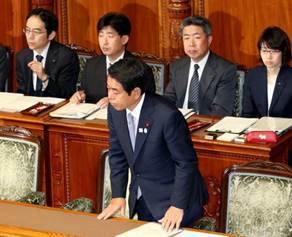 The government has set an ambitious goal of putting Japan in third place in the medal count for the Tokyo Olympics. The government is also providing money to achieve the target. In the current fiscal year, 6.3 billion yen ($52.66 million) is being spent to develop Olympic-caliber athletes, up 2.2 billion yen from the previous year. The JOC has asked the government to shell out 80 billion yen to 100 billion yen to support the training of Olympic-level athletes in the six years until the 2020 Games. But the government needs to stop and think how its sports budget should be spent. A Japanese medal rush would certainly elicit national applause, but the sports agency will not be established for the Olympics alone. An ideal sports-promotion policy should create an environment that not only supports elite athletes but also makes it easy for a wide range of people, including the physically challenged, to enjoy sports. While the government budget for top athletes is growing, the situation for ordinary sports-loving citizens is bleak. The number of public sports facilities in Japan has declined by as many as 12,000 in 12 years from about 65,000 in 1996, meaning that about 1,000 sports facilities have disappeared every year during this period. Consolidation of municipalities and the shrinking of the nation’s population have contributed, to some extent, to the decline in the number of sports facilities. But many facilities have been closed because of deteriorating financial conditions of local governments. Cities and towns don’t have the money to renew aging sports facilities. This declining trend is unlikely to reverse itself. Even if young boys and girls in this country become inspired by the sparkling performances of Japanese Olympic athletes, they can’t pursue their athletic dreams if there are no sports facilities in the neighborhood. A poor sports environment for the public undermines the social benefits of huge public investment for a successful Olympics. The responsibility for sports-related policy measures has been split among multiple ministries and agencies. The health ministry, for instance, is responsible for policy efforts to promote public health and fitness, while the infrastructure ministry is in charge of developing athletic parks. A plan to centralize the administration of sports-related policy measures was crafted, but it was, regrettably, dropped in the face of resistance from ministries and agencies trying to protect their vested interests. Jurisdiction over areas that can be more efficiently managed by the sports agency should be transferred to the new body. In particular, promotion of health is closely related to sports. Promoting sports can lead to an estimated 7.7-percent cut in the 40 trillion yen of annual health-care spending by the government. A survey by the University of Tsukuba has found that elderly people who have taken part in health and sports classes end up spending 100,000 yen less on medical bills annually than those who haven’t. People can enjoy sports not only alone but also in groups, which can create closer ties among people. The sports ministry has started a local-revitalization program by using sports to develop a sense of community.